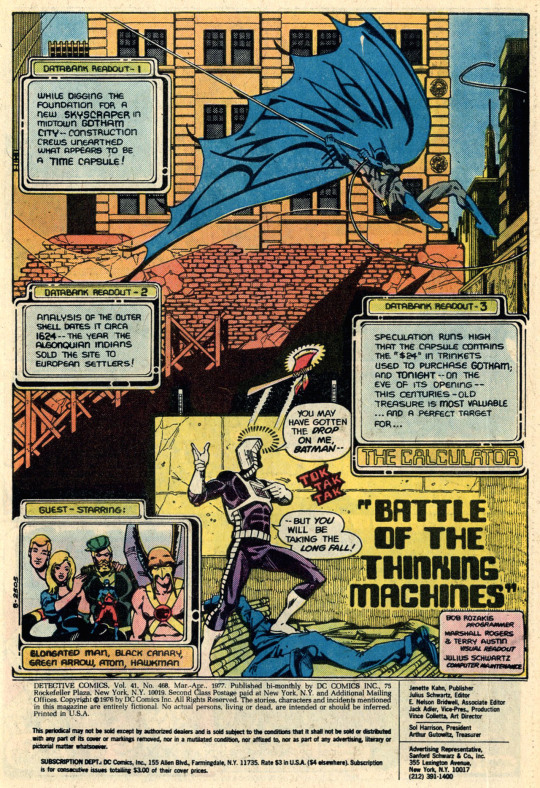 The next issue of DETECTIVE COMICS wrapped up the saga of the Calculator, which had been winding through the assorted back-up stories for several months. And it looked more like a Justice League adventure than a strictly Batman one, so I bought a copy. The story goes that editor Julie Schwartz took a lot of crap from high-ranking folks at DC for allowing Marshall Rogers to illustrate the whole book. They didn’t feel as though he was ready for such an assignment, that he drew too weird–weird mainly being in reference to his proclivity for page layouts that weren’t strictly in grid format. But the reader response to the issue was extremely strong, and so Julie’s decision was ultimately vindicated. In fairness to the nay-sayers, Marshall does often cheat his backgrounds, and he moves his camera into some strange positions. But it’s all exciting, electrifying–it’s the most modern-looking DC comic book in years, and an outlier tot he visual revolution to come, when creators such as Perez, Golden, Arthur Adams, Todd McFarlane and even Rob Liefeld will ultimately move the medium. 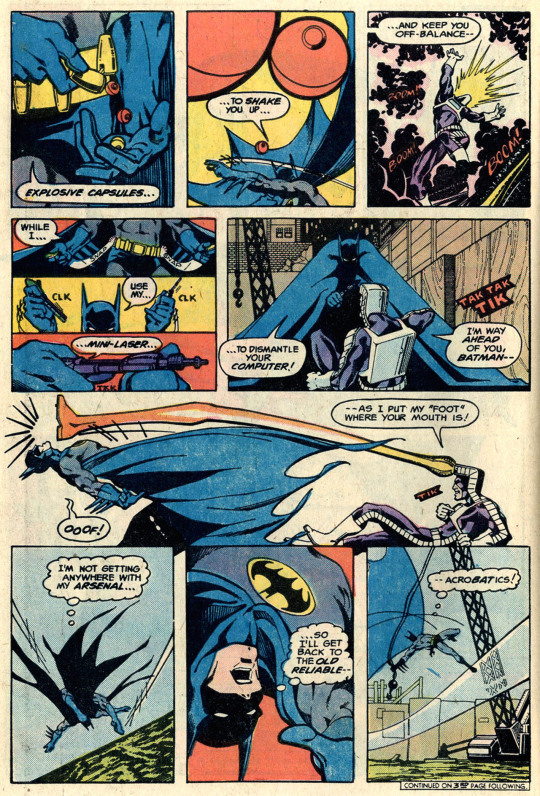 Marshall doesn’t care that Batman’s cloak, the way he draws it, it far too long to be practical, what he cares about is that it looks cool–and it does! But try tough they might, this particular sextet of Justice Leaguers can’t lay a finger on the Calculator–all of their attacks boomerang back upon them. 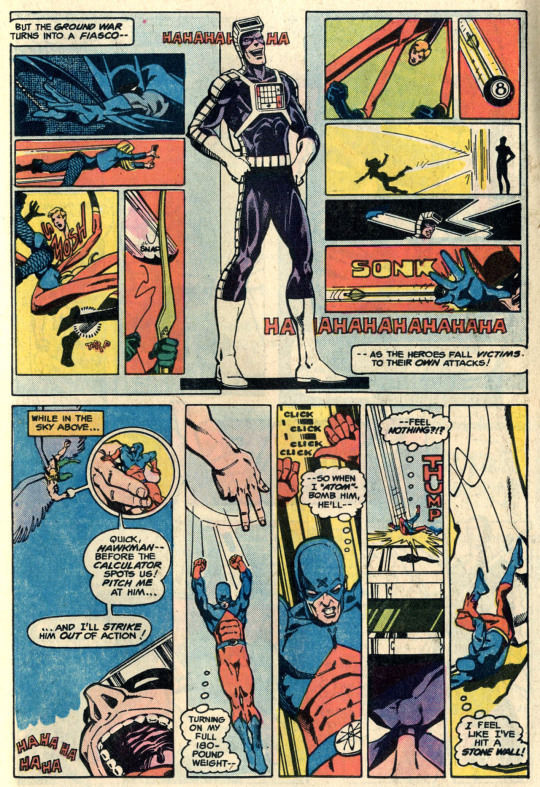 The Atom even tries switching to his civilian identity of Ray Palmer, hoping that the immunization won’t register against him in that form–but no dice, the Calculator leaves Batman and the JLA strewn in his wake as he calmly strolls away. It’s a frustrated Batman who goes back to work as Bruce Wayne, who is in the midst of a key deal with Metropolis’s Morgan Edge. As they converse about the deal and the lengths to which Edge has gone to set it up, Wayne gets a brainstorm as to how to defeat the Calculator and rushes off. Meanwhile, the Calculator’s attention has been drawn by news of a time capsule being installed at STAR Labs, which he figures is the perfect target to draw out the Flash. 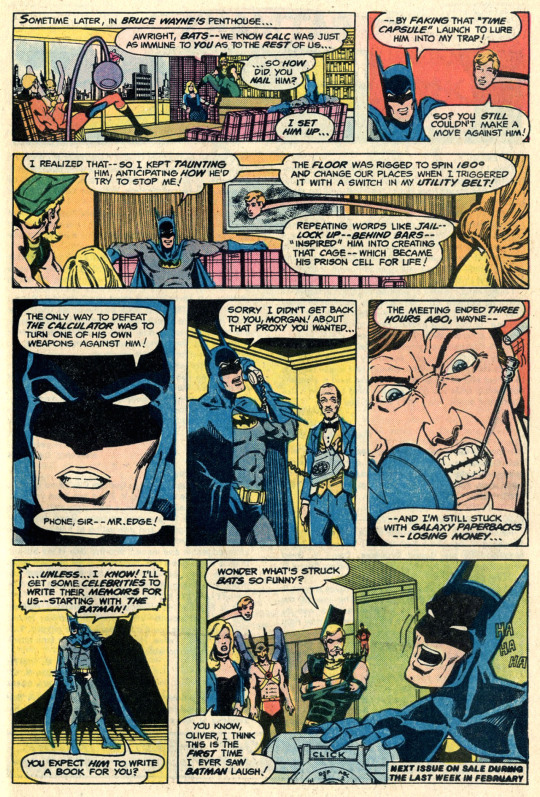 But Batman is waiting for him there–and so begins a personal duel between the Dark Knight and the Calculator of Crime. 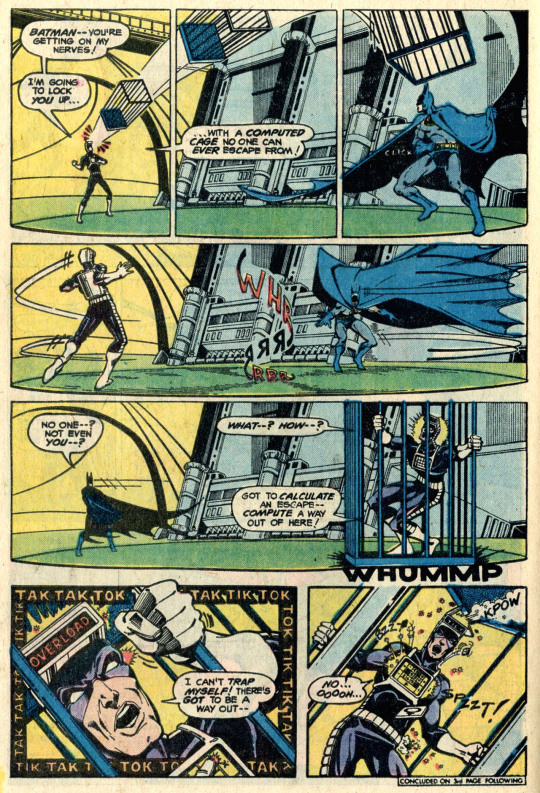 No matter what Batman throws against him, the Calculator’s computer always has the perfect counter-move ready. But when the Calculator attempts to trap Batman in an escape-proof cage, Batman triggers his trump card, a turntable which rotates the floor of the room such that the Calculator is caught in his own trap. As he tries to extricate himself from captivity, the strain causes the Calculator’s systems to overload and explode. 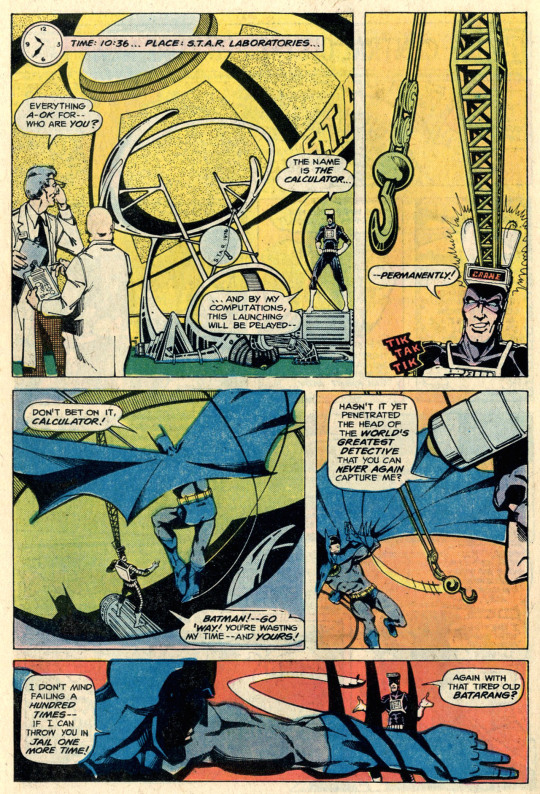 Which had been the Batman’s plan all along–he’d set it up ahead of time, and then egged the Calculator on by using phrases such as lock-up and behind bars to subtly influence him into creating a cage or prison for Batman that he could be switched into at the last moment. 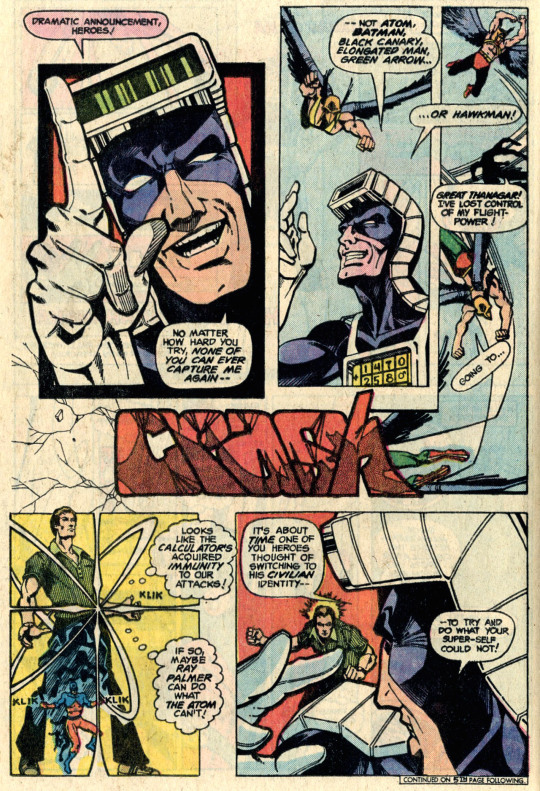 So yes, it’s a very simple story with a very simple resolution, but it’s really Marshall Rogers’ art (backed up by inker Terry Austin) that makes it noteworthy.